Edition of 3776 of which 300 are signed 1-300, 26 copies are signed A-Z as artist's proofs, and three sets are signed as progressives. April 18, 1983 17 colors, including gold foil stamping, done by Marier Engraving 17 3/8" x 24"
My mother and I were listening to the Bach Sonatas and Partitas for Solo Violin as performed by Schlomo Mintz. At its conclusion, she said that his violin had "rainbow strings," and this set off a train of thought resulting in this image for the Oakland Symphony. 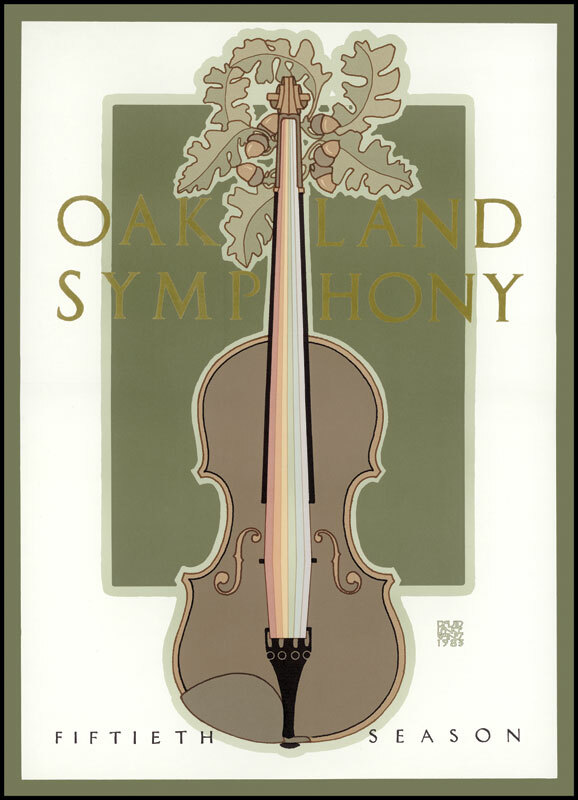 Like many organizations for which I have done posters or other designs over the last generation, the Oakland Symphony is no more. But, the echo of its rainbow strings lives on in our hearts.